R2B: RETURN TO BASE ready for the screen! How Korea's "Top Gun" was made. Taehoon, a pilot in the special flying team of the South Korean Air Force, messes up at an airshow and is ejected from the team. He is moved to the 21st Air Combat Team. One day a mysterious fighter plane appears in the skies of Seoul and amid an air alert, the 21st Air Combat Team is called upon to defend the As the sense of danger mounts, the biggest unofficial military operation begins. This is the basic plot of R2B: Return To Base. The following is how the high altitude action drama, Korea's own Top Gun, set against the unstable political backdrop of the Korean peninsula came to be. The original premise of the film was the capital Seoul being at risk of attack after the sudden appearance of a mysterious fighter plane in its skies. It may seem like rather reckless as a plot but R2B: Return To Base is based on a situation that could in all likelihood actually take place. Seoul's major landmarks such as the 63 Building, Wonhyo Bridge, and Teheran Street are portrayed as being at a military risk. A man-eating monster in the Han River The Host and a tsunami covering Haeundae Haeundae have already captured the imagination of Korean and overseas audiences. Now a cutting-edge fighter plane flying in Seoul's skies is set to bring a sense of speed and thrill. The mission of filming fighter planes, runways, as well as hangars and igloos would have been impossible without support from the Korean Air Force. The air force reacted positively to the production intention of R2B: Return To Base. After trying to convince the air force a few times, the air force decided to allow the filming of the 17th Fighter Plane Team in Cheong-Ju, the Air Force Academy and the 11th Fighter Plane Team of Daegu, the only team in Korea with the F-15K fighter plane. Security was of the utmost importance for the Air Force. It was not possible to open many of the military installations at the pre-production stage, so the production team and the Air Force co-operated through detailed simulations. At the core of the support from the Air Force was their permission to film the actual fighter plane. The F-15K, the plane the protagonists fly, is said to be the best fighter plane in the Northeast Asian region and this meant that the perfect portrayal of this plane in the film was vital. Thanks to the whole-hearted support from the air force, scenes of the F-15K actually in flight was captured in the film. Scenes of the Black Eagles Team flying at the beginning of the film were actual filmed with TA-50 planes. So, it will now be possible to check out the world-renowned Black Eagles of Korea which have won awards at international air shows on the silver screen. Realistic scenes with a minimal level of computer graphics techniques were made possible this way. The most important factor the "Wolf Air" team put into consideration was safety. The team went through a very detailed process of confirming the distance between planes with the Korean Air Force and the Korean pilots on their part did their best to ensure the highest level of safety. This was how dynamic and varied flying scenes were captured for the screen. The production team is set to bring the audiences an even higher level of aviation scenes by going through a ten-month period of post-production. The dynamic aviation scenes are at their best when they're set against the backdrop of the 63 Building, one of Seoul's landmarks. Scenes showing the destruction of the 63 Building as well as other buildings came to be thanks to the expertise and efforts of the special effects and computer graphics teams. A helicopter, not a fighter plane was brought in to film the scenes involving the 63 Building. Kim Hyo-jin, director of photography, shot from a helicopter to capture the perfect angle for the 63 Building and other scenes of Seoul. The art team built a set to portray the chaos inside of the 63 Building. The sheer force of a jet engine was captured realistically through the explosion of glass and office equipment. If you've seen the footage of Jung Ji-hoon training for the 9G test, you'd have an idea of how hard the actors worked for their parts. To play the part of fighter plane pilots of the air force, the actors had to prepare hard physically as well as to examine the characters' inner aspects. The actors training period was between four months and a year because they had to acquire the physical condition of actual fighter plane pilots. 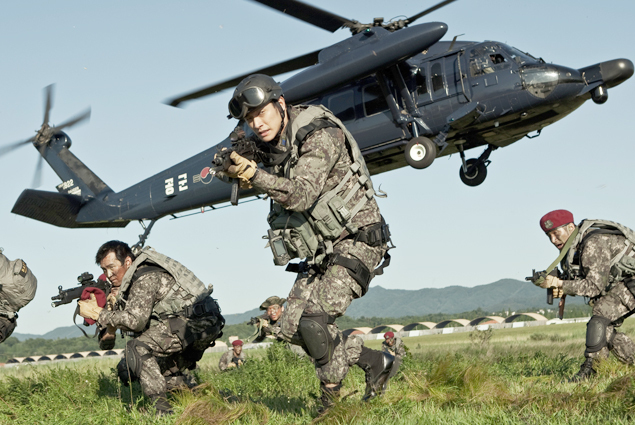 Jung Ji-Hoon and Yoo Jun-Sang, who play rival pilots in the film, actually became rivals as they trained for their parts. It wasn't enough to do physical training. The actors had to pass mandatory tests for actual pilots to be able to get into the cockpit. The actors took part in the mandatory training test in a low-pressure chamber, emergency escape routine, simulated flight as well as training to develop tolerance for acceleration. The training involved not only physical excellence but mental strength as well. 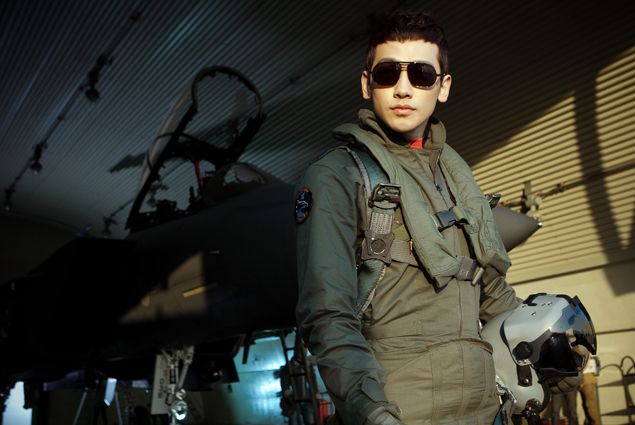 Jung, playing the part of the genius pilot Taehoon surprised air force officers by passing the 6G and 9G tests in one single day, exhibiting his passion for the film. On the other hand, Yoo, playing the part of Cheol-hee who wins the honor of "Top Gun" passed out twice before he passed his 6G test, only passing on his third attempt.